Sheriff Bliss was shot and killed while attempting to capture a murder suspect. Following the murder of a local rancher, the 56-year-old sheriff and a posse cornered the mentally deranged suspect in a wash near Price. After a brief exchange of gunfire, Sheriff Bliss attempted to approach the suspect. While moving into position, was accidentally shot by a member of his posse. The suspect was also killed. Sheriff Bliss was an 18-year veteran of law enforcement and past president of the Utah Peace Officers Association. Survived by his wife and two children, he is buried in Price City Cemetery. 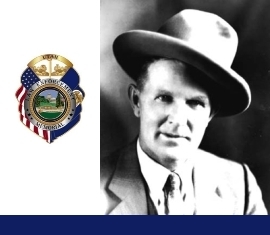 His bronze name plaque is sponsored by Weber County Lt. Art Haney. Sheriff Bliss is my great uncle . I too am a retired under sheriff with the mineral county sheriffs office . Anyone interested in contacting me can find my name in the Fallon Nevada phone book .